The Noonday Concert Series provides free access to live performances by Maine’s most talented musicians throughout the academic year. The series has always been an integral part of the Conservatory’s mission to provide equal access to high quality music and highlight its talented faculty and students. A student of the late Udi Alan Shavarsh Bardezbanian, Eric LaPerna, formed Zapion in 2010. Zapion plays folk, classical, Sufi, and art music from the Turkish and Arab traditions, as well as Armenian, Iranian and Balkan music. Zapion got its name from a Greek Taverna Udi Al used to perform at in the 70’s, and are doing their best to keep the music he loved alive. Eric LaPerna has been a performing musician for over 25 years. He is well versed in many different styles of percussion but Middle Eastern hand drums and rhythmic systems are his specialty. 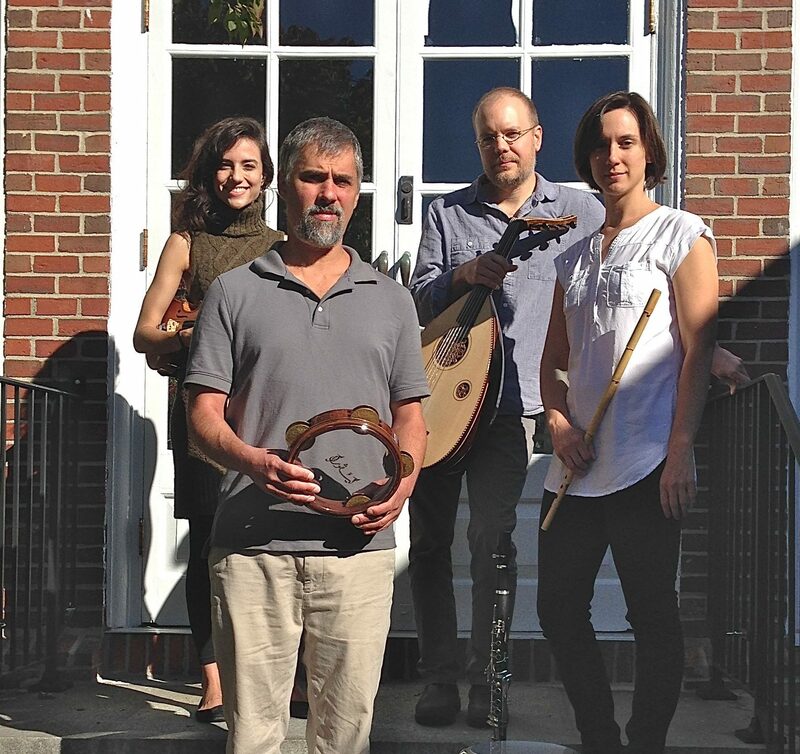 He is a founding member of Okbari Middle Eastern Ensemble and Zapion and has played with some of Maine’s most prestigious ensembles and performers including the Daponte String Quartet and the late Udi Alan Shavarsh Bardezbanian. 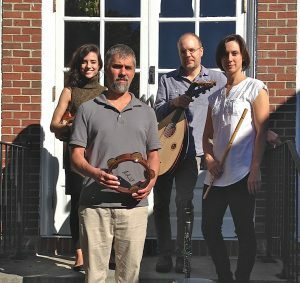 Eric is the Director of the Bowdoin College Middle Eastern Music Ensemble, and is a member of the Applied Music Faculty at Bates College as well as adjunct instructor of hand percussion at Bowdoin College. He also teaches private lessons and workshops on Middle Eastern hand drums and music throughout New England. Maria Wagner, clarinet and nay, has performed with the Portland Symphony Orchestra, the Bangor Symphony Orchestra, PORTopera Orchestra and more, and maintains an active freelance career in Maine. She specializes in the performance of new solo and chamber music and has premiered many works for the clarinet and bass clarinet at new music concerts in Portland and New York City. Maria did her undergraduate and graduate study of classical clarinet performance and pedagogy at the University of Southern Maine with Dr. Thomas Parchman. Her primary teachers of music from the Middle East include master Armenian oudist and clarinetist Malcolm Barsamian, Middle Eastern percussionist Eric LaPerna, and also ethnomusicologist Dr. Ali Jihad Racy of UCLA when she attended Simon Shaheen’s world-renowned Arabic Music Retreat. Maria lives in Portland where she maintains an active private teaching studio. She is also on the applied music faculty at Bates College offering nay lessons as well as on faculty at the Portland Conservatory of Music. Driven by an endless curiosity, composer/multi-instrumentlist Nathan Kolosko’s musical interests cover a wide breadth of repertoire and genres. From Taiwanese aboriginal choral works to Hungarian chamber music his compositions have been performed and recorded by numerous musicians. Trained as a classical guitarist Nathan also performs on Oud and Kamancheh and has a deep interest in Persian and Arabic classical music. Sarah Mueller, a Maine native, spent several years touring North America with her family’s bluegrass band, appearing on four albums as a fiddler, songwriter, and arranger. She is an active session player, most recently appearing on the prog metal album Heliodromus by Sunrunner (Minotauro Records), and Am I Born to Die?, the well-received debut release of The Ghosts of Johnson City, a local folk/Americana band. She maintains an active interest in the traditional music of America, Eastern Europe, and more recently, the Middle East. She has performed with numerous regional orchestras, chamber groups, and ensembles, including Okbari Middle Eastern Ensemble, Cinder Conk, the Casco Bay Tummlers, and New Orleans-based Bulgarian folk trio Mahala. Sarah is a violin performance major at the University of Southern Maine, where she studies with Dr. Robert Lehmann. She has participated in masterclasses and workshops with Mark O’Connor, the Ying Quartet, Darol Anger, Yale Strom, and Mike Block, among others. Founded in 1995, the Portland Conservatory of Music is a nonprofit community music school. They educate through musical instruction and concert performances. The Noonday Concert Series offers free access to performances by the Conservatory’s talented faculty, arguably among Maine’s most esteemed musicians. The weekly concerts are held in downtown Portland throughout the academic year. The series has always been an integral part of the Conservatory’s mission to provide equal access to quality music and highlight its talented faculty and students. Portland Public Library will be hosting the Noonday Concert Series every third Thursday at Noon, starting in October. For more information on the Series or the Portland Conservatory of Music, please click here.